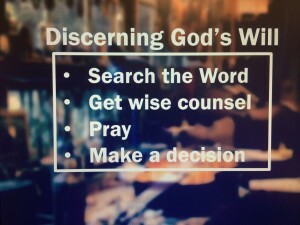 Wednesday night Resonate finished its Purpose series walking through each of these five purposes as a ministry starting with Loving God. 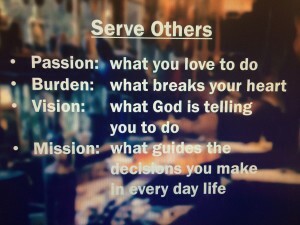 Last week we talked through the purpose of Serving Others. 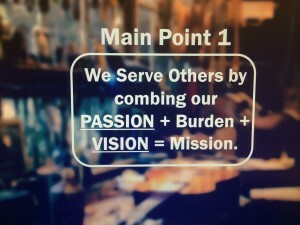 We Serve Others by combining out passion + burden + vision = mission. This equation can give us the who, what, when, where, and how. Understanding our passions that God has given us and the burdens He lays on our hearts help us to hear the vision He is giving us to live out, but often we still get tripped up or stopped in our tracks trying to discern God’s Will. 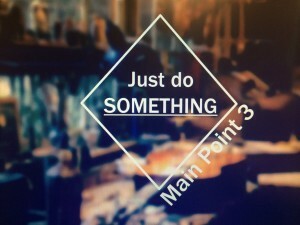 The big idea is that you just have to do something. Stop sitting on the sidelines and get in the game. 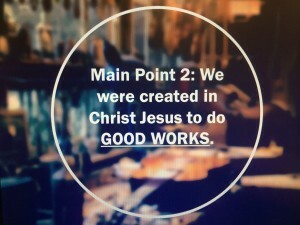 Through your experiences you will figure out what you’re good at, what you like, and how God may be using you.